Bolsa in Oak Cliff is hands down my favorite place to eat, drink and be merry. The atmosphere is laid back and you can’t help but feel at home. 1/2 price wine on Tuesday nights makes me feel even more at home. The food is fresh, local, fun and not over the top. The menu does change on a daily basis but there are a few mainstays I indulge in on every visit. The bruschetta flight is a delightful array of 4 variations on this ever popular appetizer. Tomatoes, Proscuitto, Salmon and my personal favorite: Fuji Apple with Honey & Almonds. I made a few tweaks with the addition of the goat cheese and chose a juicy Bosc pear at the market. I am making this again today with a Honeycrisp apple – which I imagine will be the nuts! Lightly toast slices of bread in 350 degree oven for 5-6 minutes. Spread each piece of bread with a thin layer of goat cheese. Fan 4-5 slices of pear over the goat cheese and drizzle with honey. 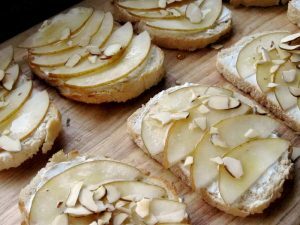 Sprinkle the top of each with the sliced almonds. love the Brushetta at Bolsa! I am going to try this at home! Mmmm, I'm going to make these for some guests I'm having over this weekend. So easy!